Poutine is a French-Canadian classic that is served across Canada. It's a hearty dish of French fries, fresh cheese curds, and brown gravy. It's famous for its "day after" curative powers, and crowds of revelers can be found digging into piping hot bowls of the stuff late at night or later the next day in Montreal and the rest of Quebec, not to mention many parts of Canada and border states in the U.S.
Poutine can be crazy delicious—drawing you to eat more than your actual appetite would ever dictate—or disturbingly greasy and oddly flavorless; it's all in the preparation. Freshly made fries cooked until perfectly crispy, squeaky fresh cheese curds cut into small pieces, and well-seasoned made-from-scratch gravy can come together beautifully, no matter how odd the combination may sound to the uninitiated. The hot fries and steaming gravy gently melt the cheese a bit; at first the three elements are eaten alongside one another but as you get further into the bowl they meld more and more, changing each others' textures and flavors along the way. Legend has it that poutine was first put together in the 1950s. Several towns claim to be the birthplace of this beloved Canadian snack-meal-diner specialty. A favorite version puts the birth in Warwick in 1957. The story is that at the request of a truck driver who wanted something hot to go, Fernand Lachance combined hot French fries and cheese curds and proclaimed "Ça va faire une maudite poutine!" or, in English, "It will make a damn mess!" One thing is not in doubt: poutine comes from Quebec. The warming nature of a poutine is perfect for the chilly winters that hit this province; the fries honor the humble potato that grows so well in parts of Quebec, as well as the French tradition of hot crispy frites. The fresh cheese curds were so widely available because French-Canadians kept up the cheese-making traditions of France long after the initial settlers established Nouvelle France. What began in Quebec by no means stayed in Quebec, however. 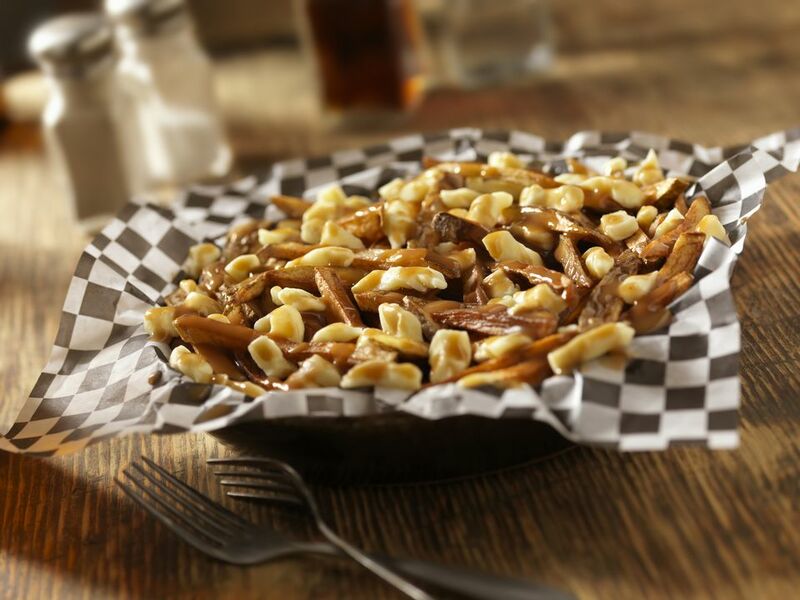 Truck drivers who loved the affordable sustenance poutine provided started requesting it from establishments outside the borders of Quebec and dragged the filling dish with them from the Maritime Provinces along the Atlantic all the way to B.C. and the Pacific. The dish has taken root in the diner, casual, and fast-food culinary world of Canada. Fine dining restaurants have gotten in on the action, too, by dressing the humble dish up with duck confit, foie gras, or lobster. Other places take advantage of the flexible nature of poutine and make corn dog poutines, pepper poutines, and poutines made in themes of ethnic cuisines. Plenty of places now offer optional ingredients like different types of cheese, various sauces, and even sweet potato fries.